1. We take data protection seriously. To optimize your search using www.conferencehotel.com, we need to store and process the data you fill in on our online form in accordance with the following conditions. We do not initially include your personal data (data that indicates who you are or makes it possible to identify you) in the request transferred to your chosen supplier of accommodations and/or space for events (e.g. hotels or conference centers). This information is not passed on until after the supplier has made an offer. If none of the suppliers of accommodations and/or space for events you have chosen is able to make an offer, we ask meetago GmbH to search for an alternative supplier. For these purposes, we pass on the data you have supplied us to meetago GmbH so that it can carry out the search for you. If you have included your business address and name in your enquiry, meetago GmbH will contact you about an alternative supplier by phone. There is no charge for the search for alternative suppliers. We use technology from etracker GmbH (http://www.etracker.com) to improve our service quality, and for marketing and optimization purposes. It enables us to create user profiles using pseudonyms. When you visit this website, the data collected with etracker technology will not be used to identify you personally or to link your personal data to the pseudonym unless you have given your express consent. You may at any time revoke your consent to the collection and storage of your data with future effect (https://www.etracker.de/privacy). 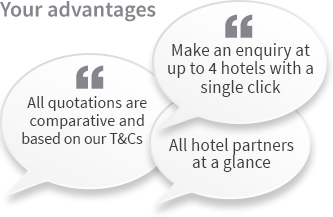 Furthermore, we use what are known as cookies in processing your booking enquiry. Cookies are small text files which are stored in an intermediate memory (buffer) of the Internet browser you use when you visit our website. Cookies are not person-specific and simply make it possible to recognize your Internet browser. Apart from the use and disclosure of your personal data in the way described above, your data will only be disclosed to third parties with your consent and in accordance with the provisions of the Federal Data Protection Act (Bundesdatenschutzgesetz). This also applies to the deletion of your data, which is deleted at regular intervals in accordance with the requirements of the Federal Data Protection Act. 2. Who is the contract partner? Through your booking request, legal relations only come to pass between you and the supplier you selected. conferencehotel.com is only “an electronic messenger“ of your booking request. conferencehotel.com is no longer involved when it comes to your later booking and the coming to pass of contracts. Please contact your contract partner, should there be discrepancies between the offer made and the booking confirmation of the supplier. As conferencehotel.com is not the supplier for your requested services, we also do not take responsibility for the not fulfilling of obligations that result from the contract made between you and the supplier. All details about the supplier and its services, as well as his non binding self assessment (for example the stars of the hotel) stem from the supplier. We do not take liability for the correctness of this information. Should conferencehotel.com despite careful transmission of data make a mistake through negligence then liability for that is excluded. We are unable to give advice or information concerning for example passport-, visa-, customs- or health regulations. 4. Who do I have to pay and how much? You pay the booked services to the supplier. You owe conferencehotel.com nothing for this service. This also applies when we initiate a search for an alternative supplier for you. When a supplier submits a fitting offer to your request profile, you are informed about it via email. This email contains a link that leads you to the offer that was made just for you. The quoted price for services to be rendered, given in the name of the supplier, is not from us but comes from the supplier. The operators of the internet platform act exclusively on the basis of the law of the Federal Republic of Germany and can only be claimed on, through the court having jurisdiction over where the company is domiciled.